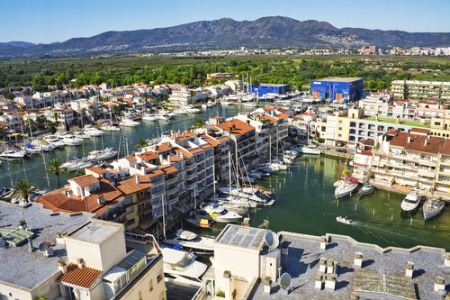 Empuriabrava holidays take you to the Costa Brava, thirty miles south of the French border. Located in former marshland, it is an unusual purpose-built resort with fourteen miles of canals running through the village. Holidays to Empuriabrava can be taken from April and October with temperatures rising from twenty to thirty degrees at the height of the season. There is a very large marina and many visitors here hire boats. A kilometre long beach offers safe bathing and a variety of water sports. Holidays in Empuriabrava have wide popularity as there is so much to see and do. Many of the villas and apartments have gardens extending to the canals and the resort can be explored by boat. We have a number of cheap Empuriabrava holidays which may entice those looking for reliably good weather in Spain's beautiful Costa Brava. This lively resort has great restaurants catering for all tastes and its shops and boutiques provide for all your needs. Bars and clubs create a party atmosphere from dusk until the early hours of the morning. Since our low cost Empuriabrava holidays sell out quickly, it is best to book early in order to avoid disappointment. Apart from the usual holiday activities, Empuriabrava offers sky diving in a local diving school, and there is also a go-karting track and a choice of golf courses. So for a fun-filled break, try one of our Empuriabrava holiday offers. For further details and to discover our best Empuriabrava holiday deals, please use the search facility.